Hello! I haven’t been able to write anything on this blog for the past few weeks because of the high amount of work and deadlines I’ve been trying to chase. What can I say, I love what I do. I was set to launch two websites in three weeks but I’m basically done with one so my time is freeing up a little. Back in August when I had just launched my site, I wrote about how Blizzard.com can do better with their website. I talked about how their website inspired me to learn web design and development a decade ago and how they seriously needed a makeover.Last Friday, to my surprise, I get a personal e-mail from the Lead Web Designer of Blizzard.com who told me he found the article I wrote last August and was thankful for the input and thoughts I shared, as well as following their web presence after all these years. Needless to say I was pleasantly shocked that someone from their web team would respond and that e-mail made my day. Talk about reaching out to your customers, a classy move indeed. Of course, it was no coincidence in terms of timing that they wrote me last Friday. They also wrote to tell me that they had just launched their new redesigned website. 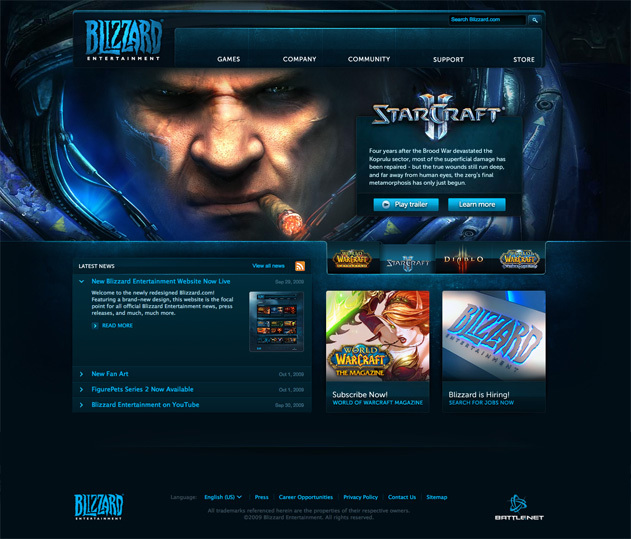 Without further ado, I give you a screenshot of the newly redesigned Blizzard.com homepage. I think their new website is awesome, in a professional sense of course haha. It’s what you’d expect from a 2009 redesign with the corporate color pallete intact and the game-inspired user interface that makes who Blizzard is. The mix of a clean and edgy feel allows them to not only be Blizzard the corporation, but Blizzard the gaming corporation. I’ve always enjoyed how Blizzard uses flash as a supplement to their pages. With some of the best animators in the world, they have the resources to produce these very creatively done animations. Last time I used Flash, particle engines were picking up steam and usage so I wonder what engine they used to create the effects, if any. LOL They still don’t have a favicon. Hope they see that soon. I have mastered a quittany of new to the job objects from your web situate on the subject of private computers. One more thing I have for eternity unspoken is that computer systems have become a product that all residence must have on behalf of a lot of reasons. They equip you with well-situated behavior in which to systematize the home, compensate bills, turn shopping, report, tweak in to music and in countless cases consider box series. An innovative performance to all-embracing mainly of these tasks is a computer. These desktops are portable ones, petite, robust and convenient.